Add another team to Ohio State’s growing list of national champions. 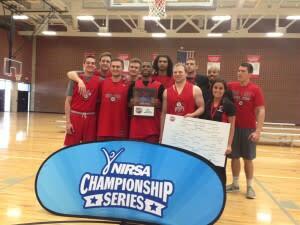 The OSU Ballstars Gray won the NIRSA men’s club national championship on Sunday, topping James Madison University 64-51. “This feels great, amazing,” said Ryan Murray, who scored 26 points in the championship game and was named MVP of the men’s club division. The Ballstars big win capped three days of excitement and success on and off the court for Ohio State, as the Office of Student Life, Recreational Sports hosted the national tournament for the first of of three consecutive years. There were 84 teams from 67 colleges competing in the men’s and women’s club, intramural and unified sports divisions, including teams from Albany State University to the Zags of Gonzaga (sorry, this is the closest there was to a Z school). NIRSA was founded in 1950, serves an estimates 8.1 million students and hosts regional and national championships in a wide variety of club and intramural sports. “Our site selection process is just like the NCAAs,” said Aaron Hobson of the University of Florida and NIRSA. He was co-tournament director with Dexter Short of Ohio State’s Recreational Sports. Ohio State’s Recreation and Physical Activity Center (RPAC) is one of the largest and best recreational facilities in the country. “We were able to use 12 courts at a time and this allowed us to bring in the maximum number of teams,” Hobson said, adding that about 2,000 people came to town for the tournament. BTW: Hobson is a Buckeye. He earned a master’s degree in sports management from Ohio State in 2010. And he’s noticed a big change in Columbus since he graduated. The tournament was held at North Carolina State the past three years. Ohio State has one of the largest and oldest intramural program in the country. More than 10,000 students participate in at least one intramural sport each academic year. And it has RPAC. Many universities have club teams in a wide variety of sports, in addition to their intramural programs. Club teams “are student organizations with a president, and executive board and they pay dues and are usually partially funded by the college,” Shorter said. Both club and intramural teams feature passionate athletes who devote a lot of time to the sport – or sports – they love. North Carolina AT&T made it to the quarterfinals in 2015. The Ballstars have been at it since the academic year began. 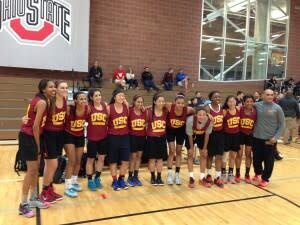 The Ohio State club team split into two teams for the NIRSA National Championships. The second team, the Scarlets, advanced to the quarterfinals before losing to Boston College. The Ohio State women’s club team advanced to the semifinals before losing to Wisconsin. Murray is in his first year at Ohio State, a transfer from Centre College, where he played basketball. He was a standout for Springboro High near Dayton. James Madison was a bit taller than the the Ballstars Gray, but the home team was quicker. “We wanted to run in transition and use our quickness,” Murray said. Murray and Marquis Gaines were named to the tournament’s All-American team. USC won the women’s club team championship, North Carolina A&T also took the women’s intramural crown and Alabama won the unified title.